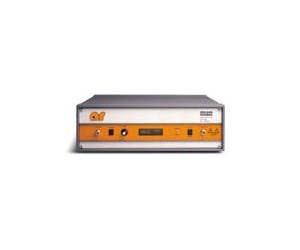 The Model 75A250A amplifier is a portable, self-contained, air-cooled, broadband, solid state amplifier unit designed for laboratory applications where instantaneous bandwidth, high gain and moderate power output are required. Utilization of push-pull MOSFET circuitry lowers distortion, improves stability and allows operation into any load impedance without damage. When used with an RF sweep generator, the 75A250A will provide a minimum of 75 watts of swept RF output power. The Model 75A250A includes a front panel RF Gain Control, which permits the operator to conveniently set the amplifier'''s desired output level. Housed in a stylish contemporary enclosure, the unit provides instantaneous power for typical applications such as RF susceptibility testing, antenna and component testing, Watt-meter calibration and as a driver for higher power amplifiers. The 75A250A is powered by a high efficiency switching supply, with autoranging AC input circuitry which will automatically accept voltages from 90 to 135 VAC, or from 180 to 270 VAC, in the 47 to 63 Hz frequency range. The RF Amplifier stages are protected from over temperature by removing the DC voltage to them if an over temperature condition occurs due to a cooling blockage or fan failure. The digital display on the front panel indicates the operation status and any pending fault conditions when an over temperature or power supply fault has occurred. The unit can be returned to normal operation when the condition has been cleared; as with the other functions, this can be readily accomplished through a front panel switch. The unit also includes digital control for both local and remote control of the amplifier. The 8-bit RISC microprocessor controller board provides IEEE-488 (GPIB) and asynchronous full duplex RS-232 communication control of all amplifier functions.